Downtown Oakland's oldest running tattoo shop. We have an artist for every style of tattoo that you could need. 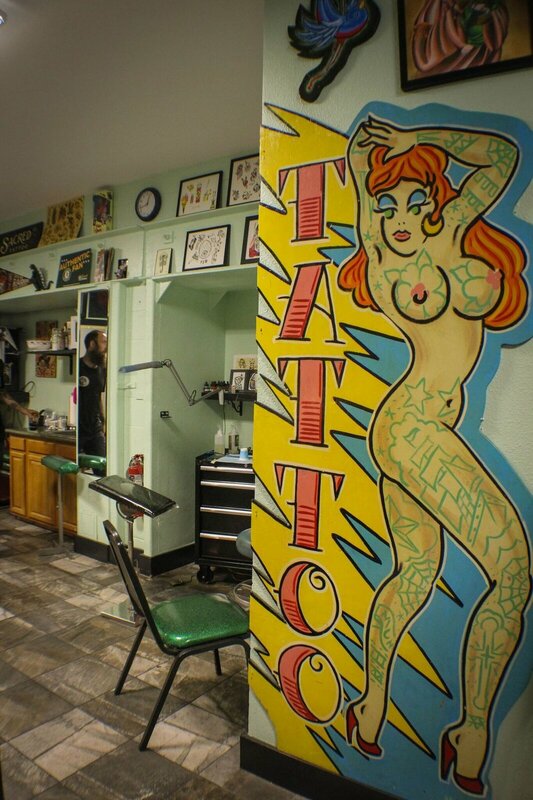 Sacred Tattoo is available for custom tattoos by appointment or walk-ins, seven days a week. Walk-in tattoos can be custom designs as well, but we encourage you to make an appointment for large or complex designs. To book a tattoo appointment, you must have an in-person consultation and leave a cash deposit. We can answer many of your general tattoo questions via email or phone, but to book an appointment you must come into the shop. Please note, we have a strict 48-hour cancelation/reschedule policy for all appointments. Appoinments canceled or rescheduled within 48 hours of the appointment will forfeit the deposit. Appointments made within 48 hours of appointment date will forfeit deposit if cancelled. Deposits are required for all appointments. We cannot take appointments over the phone unless a deposit has already been made. Deposits are cash only and we have an ATM in the shop. Deposits are generally $80.00 and apply to the final sitting when the tattoo is completed. If you have any questions feel free to give us a call, 510-251-8287. We look forward to hearing from you! We are a located in the Old Oakland area of downtown Oakland. We have two parking spaces for customers. The closest BART station is 12th Street.